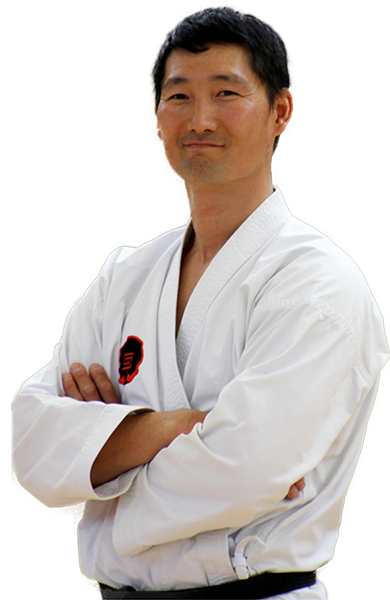 Shudokan Family Karate – Traditional karate at its best! 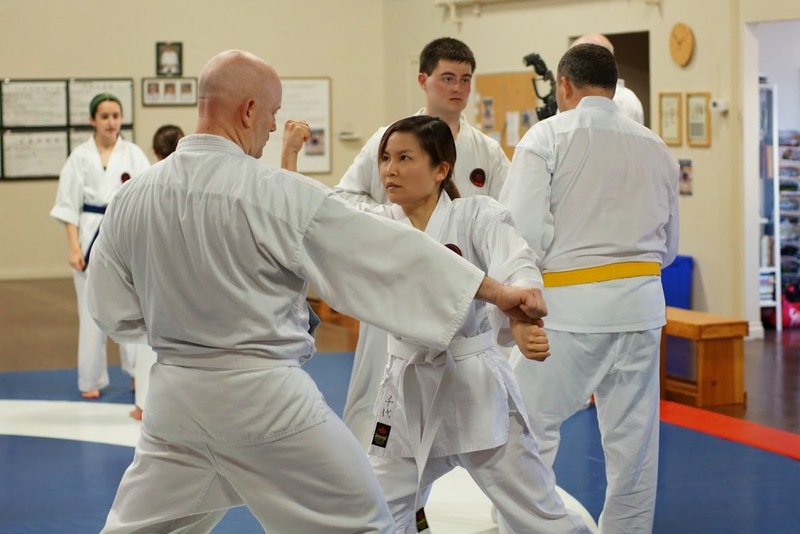 SHUDOKAN FAMILY KARATE CENTRE is dedicated to offering great martial arts programs to the residents of Burlington, Oakville, Milton, and the surrounding area. At Shudokan, we teach traditional Okinawan Goju-Ryu Karate using the methods originally developed by the style’s founder Sensei Chojun Miyagi. These methods have been passed down in their original form from one generation to the next. Our team of world-class professional karate instructors provide the highest level of martial arts education for students of all ages and at all levels. Shudokan is a proud member of the International Okinawan Goju-Ryu Karate-do Federation (IOGKF) and is the IOGKF hombu dojo (world headquarters). IOGKF is the largest traditional Okinawan Karate organization in the world and is committed to preserving the intangible cultural treasure of Okinawan Goju-Ryu Karate-do. Being a member dojo of the IOGKF means that all black belts are accredited by Sensei Morio Higaonna and all students’ ranks are recognized worldwide. Please call (905) 633-7946 to arrange a free, no obligation trial class. Come in and see for yourself why our members love training at Shudokan Family Karate Centre and stay with us for a lifetime of Karate! 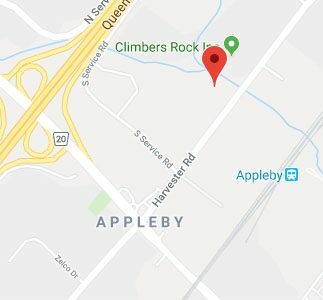 Our dojo is an expansive, custom-built space conveniently located across from the Appleby GO station (behind Dream Tire). It was designed by World Chief Instructor Sensei Tetsuji Nakamura and provides ample space for classes and gasshuku (training seminars). Karate students enjoy training on the specially created athletic mat floor which is strong but forgiving for throws and ground training. Parents appreciate the large waiting area with comfortable seating, a homework table, and a library from which students can borrow books to read at the dojo or even take home. Parents are always welcome to stay and watch classes and are often invited to participate during educational games at the end of class. This is truly a family-friendly place! Please use the virtual tour below to have a look around the dojo and make yourself feel right at home! An age specific martial arts education program for children aged five and six. This class is a mix of fun and discipline. Children will learn the basic skills of karate, develop fine motor and listening skills as well as respect for others. An early start in karate helps children develop self-confidence and improves their focus which will bring them life-long benefits. 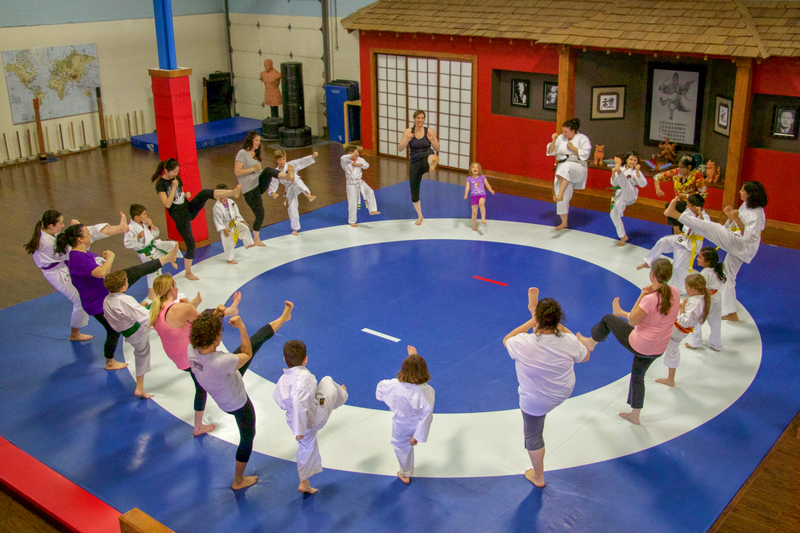 Shudokan Family Karate Centre offers family martial arts classes where parents and their children or siblings of differing ages can train together in the same class. There are many partner exercises to give the family the chance to work together, and fun educational games which teach coordination and improve physical fitness. In order to keep instruction appropriate and engaging for everyone, there are two age groups for the junior class. The first age group is 7 & 8: in this class, children will be introduced to the basic techniques of traditional karate and be taught the core values of respect, discipline, courage, and determination (never give up!). The second age group is 9-12: in this class the focus shifts to intermediate techniques, forms (kata), and sparring. 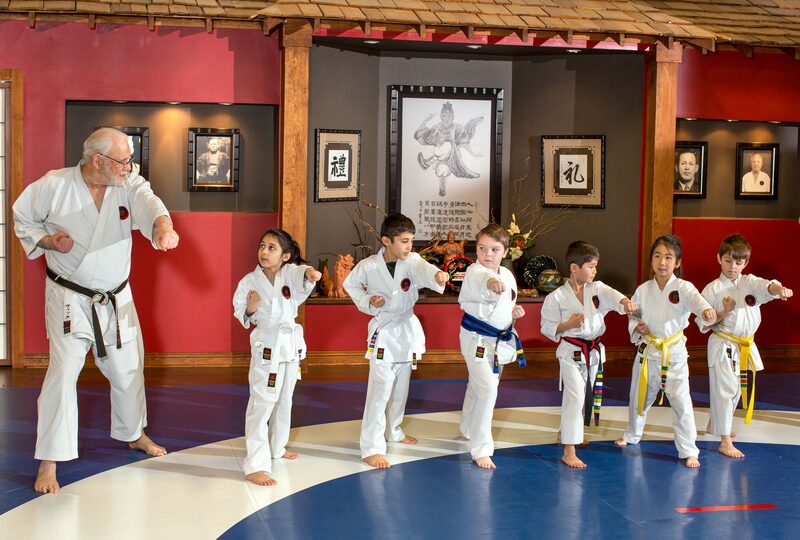 In addition to the core values, children will learn focus, self-control, mind-body coordination, and self-defense. Karate requires self-control, often self-restraint and therefore self-belief in one’s abilities. Only through discipline can one become successful and reach the higher levels. Courage allows students to overcome challenges, reach for their goals, and become successful in whatever they do. I can't speak highly enough about Shudokan dojo. My son has found a focus and discipline he didn't believe he had. The sensei and senpai are patient, firm, and have so much fun with the kids. I also like the emphasis on learning about Japanese culture and language. 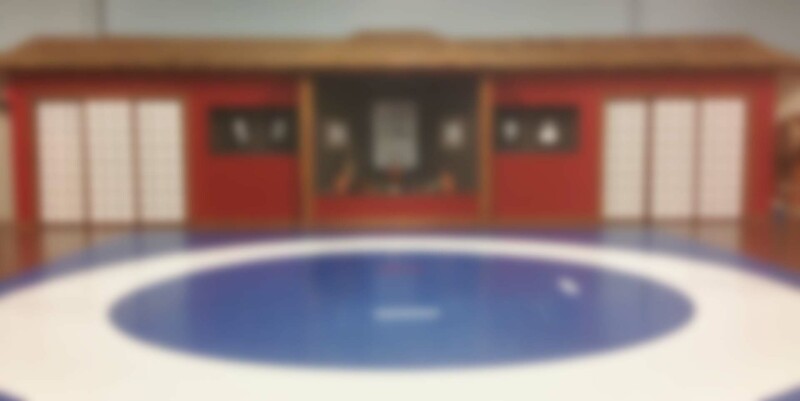 I have and will continue to recommend Shudokan to anyone looking for an activity for their child. We have been a part of Shudokan Family Karate for almost 10 years. Our elder daughter started here when she was 10 (now 19), and her little sister joined 2 years ago (now 7), so we are Shudokan family now. 🙂 The classes provide great physical training and also teach very important life lessons - never give up, encourage others to succeed, and many many more. All instructors are very knowledgeable, fun, and caring. The kids always look forward to the classes, and we are absolutely happy to have found this awesome dojo. After trying 2 other dojos, we were happy to have our kids training at Shudokan. There is a high ratio of sensei/senpai to students and the classes move at a proper pace. It is a very positive environment where our kids feel comfortable. Our children have been coming to Shudokan for the last four years. In that time, they have helped our eleven year-old daughter to overcome her shyness and anxiety problems. By teaching her the discipline of Goju-Ryu karate, Sensei Nakamura and his amazing team of instructors have transformed her into the strong, confident young woman she is today. When she challenges her dad to a push-up competitions, she usually wins! As for our six year-old son, he has learned to focus his energy and treat others with respect. We always feel a strong sense of support and community when we hang out at the dojo with other families. It is a friendly atmosphere and a true gift to watch our children overcome their obstacles and achieve the things they used to think were impossible. Shudokan Family Karate Centre has really helped my son with learning to be patient and respectful. We have been members for two years now and look forward to our biweekly classes. My son has ADHD and karate helps with his focus, confidence, and courage. This was the first organized activity for our boys. After trying another dojo, we came here and immediately saw a difference in our boys. The instructors were friendly, knowledgeable, and excellent with kids. Since coming here, we have noticed our kids have had a drastic improvement in motor skills and coordination. They also like coming to class, which speaks volumes. The dojo is friendly and very welcoming. We are so pleased and also look forward to coming. We also LOVE the focus on the spirituality, discipline, and respect taught and demonstrated by everyone, even the parents. We are so pleased. My son has been coming to Shudokan karate dojo for almost a year and he loves it. It has the most professional, well trained, and knowledgeable staff in the area. My son has learned not only martial art skills but also essential life skills. It has helped him with school focus as well. I highly recommend this dojo. My 8 year old son has been a member of Shudokan for the past year and he absolutely loves it and doesn't want to miss a class! The children learn traditional karate while having fun. More importantly, the children get a well balanced work-out of endurance, self-respect and respect for others and inner-peace. Sensei Nakamura, Sensei Vic, and all the other instructors are awesome with the children! 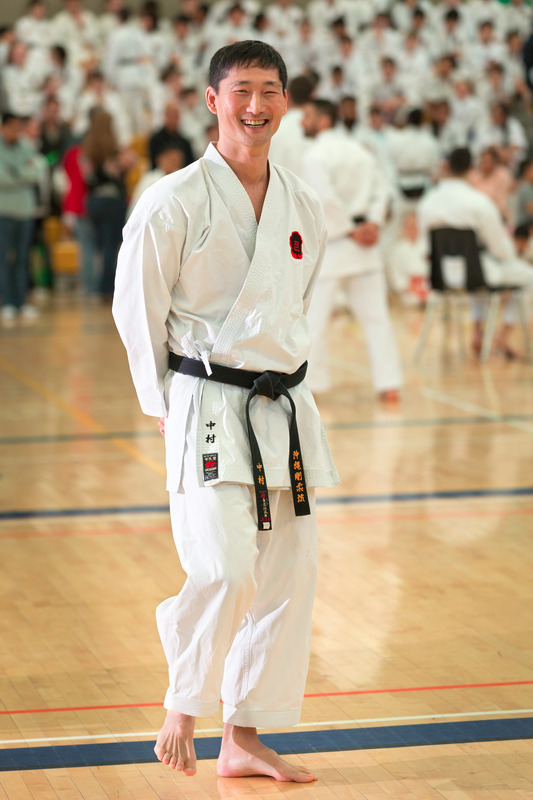 Karate is one of the best things I have ever introduced into my life. You are getting a physical and mental work out all at the same time. All of the instructors are highly knowledgeable and skilled and very patient and friendly as well as the members. I would highly recommend it for adults and children. As parents with very little knowledge of Karate we didn’t know which dojo to choose. Our research led us to Shudokan, mainly based on the fact that we are privileged to have the internationally renowned IOGKF world chief instructor (Sensei Nakamura) in our own backyard in Burlington. That was an opportunity that we had to take advantage of and it’s been the best decision not only for our son, but for the entire family. The teachings are very effective and they keep the children engaged, the atmosphere is very welcoming and the other parents are always friendly. In addition, any member will quickly notice how sincere the organization is by the level of attention and detail the instructors give to each child and through the extracurricular activities they put on each year such as the Halloween party, summer picnic, etc. We are proud to be a part of the Shudokan Family Karate Centre and it we are happy to know that we made the right decision for our son. 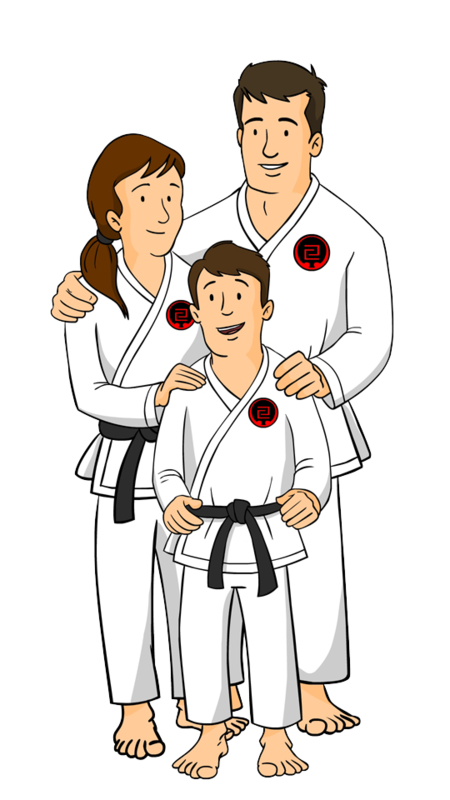 Our 8 year old son has been attending the “Shudokan Family Karate Centre” for a few years now, and we as parents could not be happier with how the centre has helped our son grow and gain much more self confidence, beyond that which could be taught at home. 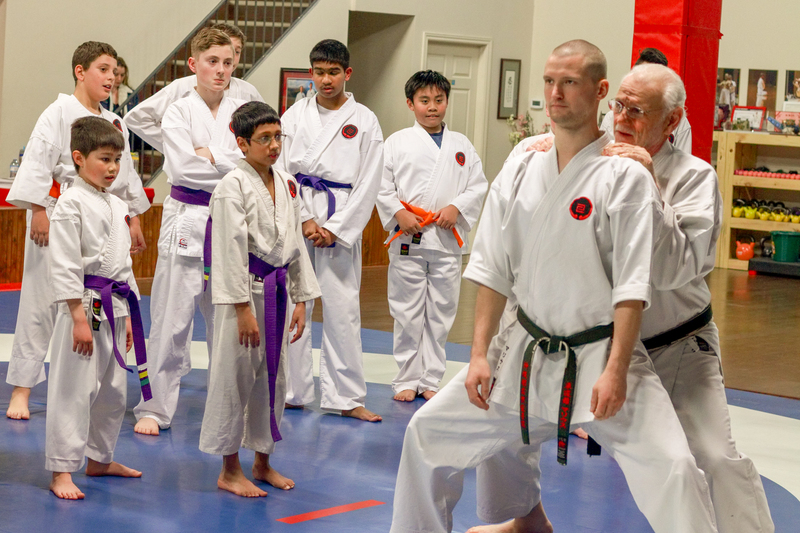 The centre not only teaches traditional Okinawan Goju-Ryu Karate, which emphasis respect and courage, but the difference lies in the instructors, who care deeply and genuinely about the kids. 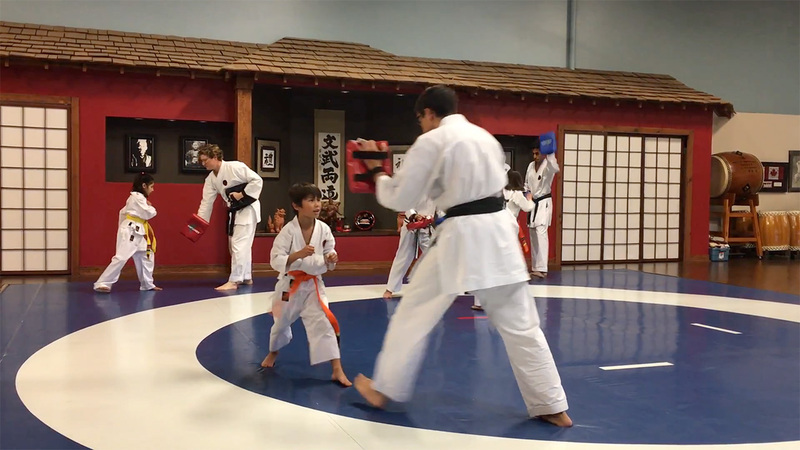 Our 8 year old son was being bullied at school for some time and we were not sure of the best way to handle the situation so we brought this up to Sensei Michelina. She is an incredible instructor and person, and always goes out of her way to help others. She took the time after class to sit and speak with us and our son directly, to help us find a solution; going above and beyond her role as an instructor. Our son looks up to her and all the sensei and senpai at the dojo, especially senpai Jordan, who has helped our son gain confidence and learn self defense. The advise given to us was extremely helpful and we sincerely appreciate it. In fact, recently at school a bully tried to punch our son and he used the blocking technique taught by senpai Jordan just the day before. He blocked, got out of the way and pulled the bully’s arm without injuring him. The other kid was shocked and asked how our son learned and did that. The key is that our son defended himself whilst not causing harm to the other kid. This shows discipline and courage, which has been reinforced at the dojo, and has given our son the respect he needs to become more confident and able to stand up for himself more. We are so proud of our son and extremely grateful to Sensei Michelia and Senpai Jordan for their help and advice. Thank you for going beyond your roles and we are really lucky to have instructors like you be a part of our lives.